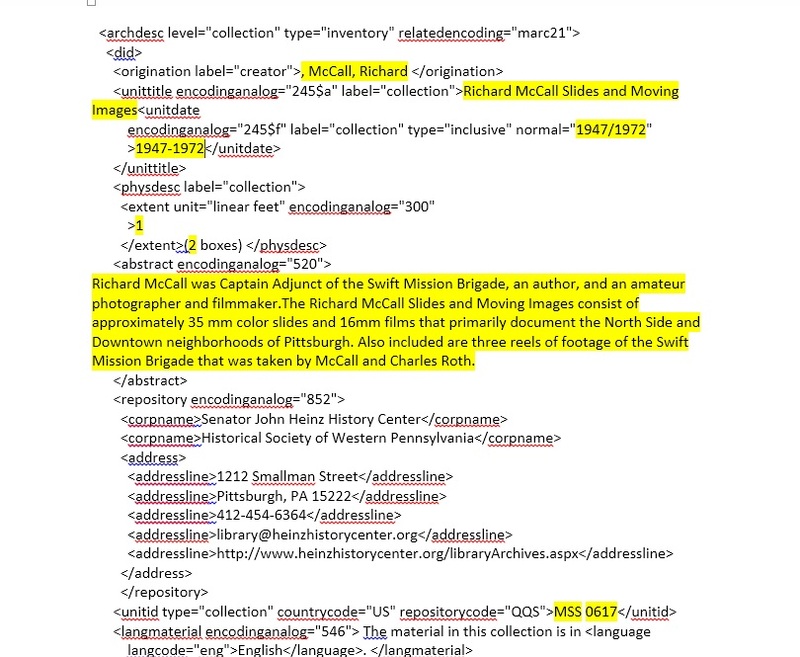 In 2011, the Senator John Heinz History Center embarked on an NHPRC-funded project to minimally process nearly 600 collections from its backlog. For each collection, a finding aid, an EAD file, and a MARC record would be produced. We planned to have Archivists’ Toolkit installed by the start of the grant, which would have facilitated the production of the three types of documents from the same data source. However, in the lead up to the project, it was determined that the organization’s technical infrastructure could not support the software without an increase in resources. With just a short period of time before work was to begin, I turned to Microsoft Access as an alternative. Starting off with a blank table, I created fields for all of the descriptive and administrative information we planned to collect, ending up with 55 fields. To make data input easier for our processors, I created a form to serve as a front-end to the database, using different tabs to organize the fields. As this was a minimal processing project focusing on collection-level description, no effort was made to accommodate the input of container lists. Figure 2: A form was created to facilitate data entry. 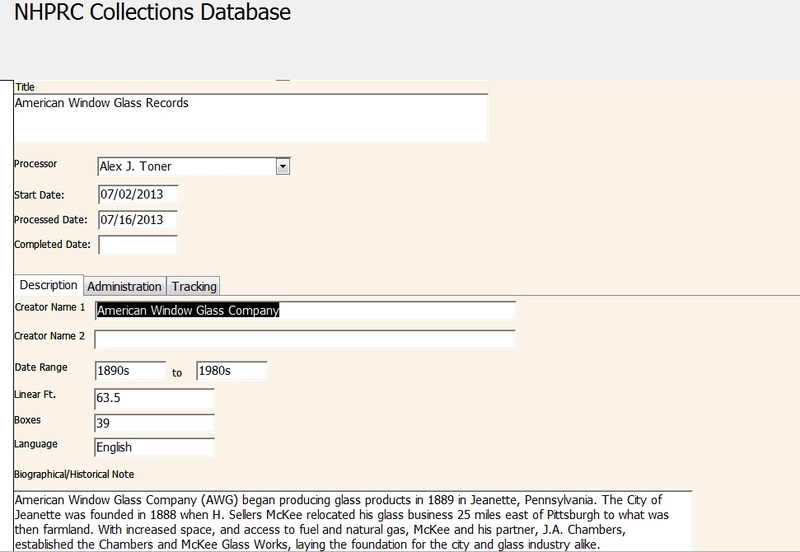 The next step involved creating a method for quickly producing the finding aid, EAD, and MARC record worksheet. Taking advantage of Microsoft Word’s mail merge function, I created templates for each type of document, which contained a mix of static text and variable fields (title, dates, extent, etc.). Figure 3: The MS Word EAD template prior to the mail merge. The variable fields are highlighted in yellow. The variable fields are linked to their corresponding field in the database. Using the mail merge, data can be pulled from Access to populate each document. 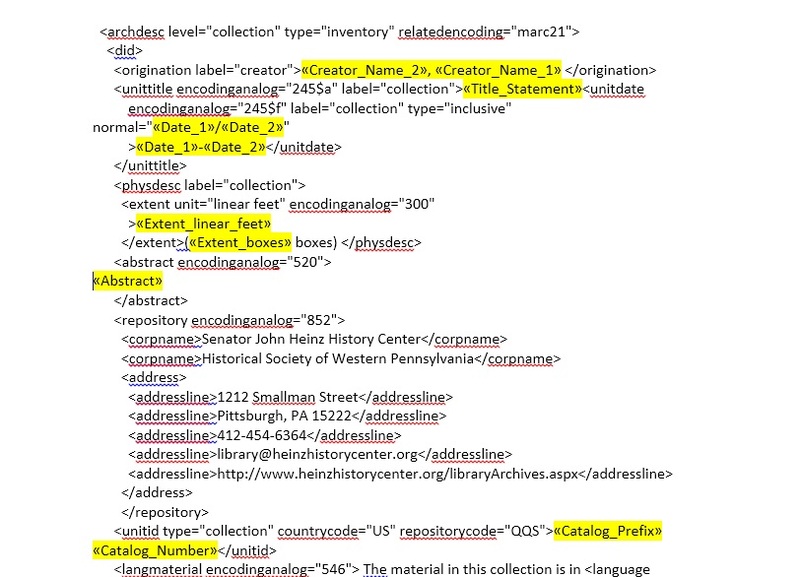 Following the merge, some cleanup is required: unused fields are deleted, subfield codes have to be added to the subject headings in the MARC worksheet, the EAD code is copied into an XML editor to ensure validation. Figure 4: The MS Word EAD template following the mail merge. 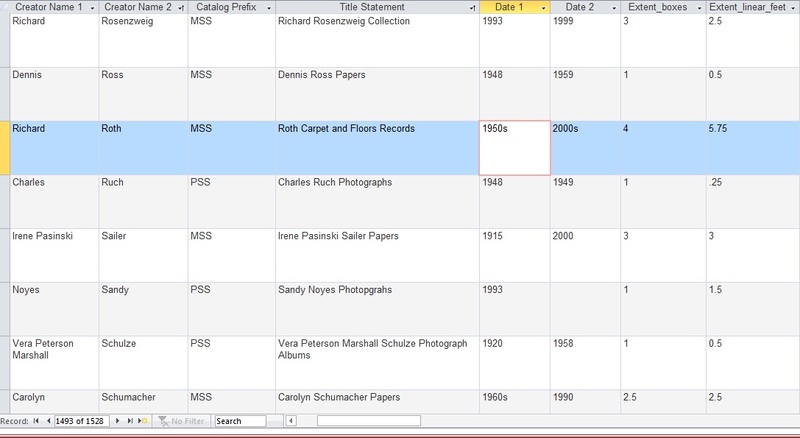 Though it would have been preferable to use Archivists’ Toolkit or similar software for this project, there are benefits to using Microsoft applications. For one, the creation of the database didn’t require any advanced knowledge or outside resources. With Microsoft software commonplace in homes and offices around the world, there is extensive user-generated support in blogs and message forums. Anytime I hit a stumbling block, a few Internet searches would usually turn up a solution. It was also very easy to modify the database after it was created. During the project, fields were added and rearranged without much effort. The workflow that existed prior to the grant called for processors to create each of these documents from scratch when processing a collection. By using this mail merge approach, information just has to be entered once, which saves time and reduces the chance of data entry errors. This system helped the History Center meet its ambitious grant project goals and is currently being used to minimally process incoming collections. The database and templates can be downloaded from http://www.dropbox.com/s/hhr9h1x3xx1wgwp/database.zip. Matthew Strauss is the Chief Archivist at the Senator John Heinz History Center where he manages all tasks related to acquisition, appraisal, description, cataloging, access, digitization, and preservation of the archival collection. From 2011 until 2013, he directed an NHPRC Basic Processing grant that reduced the History Center’s processing backlog by 75%. Matt is a graduate of the University of Pittsburgh’s Library and Information Science program, with concentration in Archives and Records Management. 1. MARC worksheets are provided to the History Center’s librarian for cataloging the collections in our OPAC.